Instagram's Buyout: How Does It Measure Up? Instagram’s billion-dollar sale to Facebook raised eyebrows yesterday, renewing cries of a new bubble. But relative to other major acquisitions of the past, how does it measure up? The spreadsheet below captures the acquisition date, dollar amounts, and ballpark counts of the users and employees at the time of acquisition. Be warned: any of these numbers are very rough, cobbled together from Internet Archive searches, old news articles, Quora answers, and tech blogs. If you have more accurate information, please leave a comment and I’ll fix it. Download the spreadsheet or view it on Google Docs. When a startup’s acquired, they’re purchased for any combination of the technology, talent, or the user base. But if you look at the payout per employee, Instagram is completely off the charts. If split equally, each of Instagram’s 13 employees would make nearly $77 million. The nearest runner-up is YouTube, with a paltry $24M for its 2006-era staff of 67. Skype, Broadcast.com, and Myspace all top the charts. The median? About $3 million. Some would point to this as a sign of a bubble, but I think it’s more likely it just reflects the incredible scalability of modern app architectures. Using cloud services, failover, and solid monitoring, Instagram can quickly scale up to support a million new users overnight with very little additional engineering effort. Instagram’s numbers are exactly what you’d want to see in a social network — high user counts with the lowest number of employees. This ratio is a measure of your efficiency, and it’s no surprise that Instagram comes out on top here, with a ratio of one employee for every 2.07 million users. The second highest user-to-employee ratio is OMGPOP, famous for developing Draw Something, the fastest-growing mobile app in history. With only one employee for every 875,000 users, they were able to scale to 50 million users within 50 days. On the other end of the scale are the short-lived Q&A service Aardvark, with one employee for every 1,800 users, and customer-service giant Zappos with one employee for every 3,400 users. More than anything, the app ecosystem rewards efficiency; your ability to massively scale with very little engineering effort. 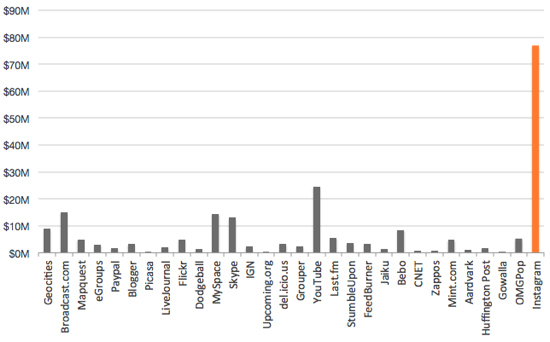 I’m guessing these ridiculously lean startups with huge exits aren’t a freak occurrence. We’ll see more of them as the rest of the world catches up, and learns how to do more with less. All figures are at the time of acquisition, and I favored active user counts over total registered users for calculating acquisition cost per year. Thanks to Tristan Louis for providing some of the rumored numbers. I originally published this yesterday on Wired, under a different headline and revised lede from my editor. To be clear, I don’t know if we’re in a bubble or not. 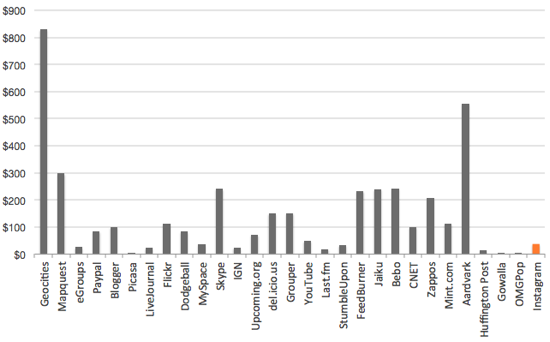 My only point is that, relative to other acquisitions, the per-user cost for Instagram isn’t insane. Union Square Ventures’ Albert Wenger added some additional thoughts, noting that the per-user costs should be discounted as the userbase grows. Many Wired commenters complained I was wrong because Instagram has no revenue. In 2006, YouTube had 34M users, zero revenue, and were bleeding $1M/month for bandwidth alone. Was Google crazy to buy them, too? Anyway, it was a good excuse to collect all of this data in a spreadsheet for the first time. I went looking, and couldn’t find the numbers available in one place anywhere. Hope you liked it. Are any of these numbers adjusted for inflation? With all acquisitions covering over a decade and a half, the effect of inflation would be significant. They’re not. If anyone wants to take a hack at it, I’ll happily add them to the spreadsheet. This means that those employees really are worth their weight in gold! How can the Upcoming.org amount be a rumor? 🙂 If you don’t know the real amount, who does? Ha, nice catch. We were contractually obligated not to confirm or deny the numbers, so I just used the rumored numbers floating around. Why isn’t Microsoft’s Purchase of Skype on there? I’m certain that YouTube had substantial revenue before google acquired them. They were doing custom profile pages for celebrities like Paris Hilton and Britney Spears for tens of thousands of $ each, more in some cases. Not sure how much public info is out there about that, but there might be some regulatory docs on the acquisition to look at. Thanks for doing the research on this and putting it out there to check out. Interesting indeed. What I think it is interesting is the “failure” rate of the companies listed above. Pretty high. Thanks for putting this together, Andy. I wonder how many of Instagram’s users were already Facebook users. And if we were to exclude those from the calculation, I’d be curious to see where Instagram stacks up (I would imagine that they would still stack up very well in terms of cost per user). I think your analysis is covering few aspects and with which we cant say Instagram is a good buy or bad. 1. You need to look at the future revenue opportunity. eg: Youtube is an alternate medium for TV, you can generate lot of adv revenue. Instagram is in social media domain, and hence a potential competition to Facebook if its goes in to the competitions hands. Prevent Instagram from coming in to FB domain.